Models, theories and principles to support learning – sometimes you need to have a good theory to provide a framework for learning as it helps you navigate your way to deeper insights and improvements. We don’t like to complicate things, there’s beauty in simplicity, not least because it makes things easier to remember. So this isn’t four-dimensional chess, just some structured approaches that underpin the skills and methodologies you need to become more effective. In his book “7 Habits of Highly Effective People” Stephen Covey distinguishes between proactive people – who focus on what they can do and can influence – and reactive people who focus their energy on things beyond their control. 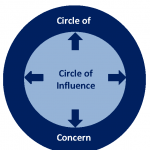 Knowing how far your circle of influence extends is an important aspect of personal effectiveness.